Bachelorette parties aren’t what they used to be. Want to wear a crown, sash and hop from bar to bar? Great. Don’t? Also great. No matter your soirée style, we’ve got you covered with the coolest bachelorette bashes any area bride would appreciate. So how do you begin the planning process? Faith Folayan, owner and creative director of This Love Weddings, a custom wedding planning studio in the Twin Cities, says to start with—who else?—the bride. “Think about your friend’s personality, and try to plan something you know she’d love,” Folayan says. What if you’re not sure? Simple—ask her. Naturally, wrangling your crew into agreeing on the same activity, budget and day isn’t always easy. “A bachelorette party is only as fun as the group of ladies you get together for the party. Be sure to ask the wedding party their ideas, their availability and what they can realistically commit to, during the planning phase,” Folayan says. Now, let’s get planning. We’ve rounded up some clever ideas to suit a range of party preferences. Pick your poison: While the Twin Cities are brimming with breweries, which are a perfect hang for a bachelorette party, don’t forget about our lively distillery and winery scene. From Norseman to Tattersall to Du Nord, many local distilleries offer behind-the-scenes tours and tastings. Norseman takes it one delicious step (or sip?) further, leading a cocktail lab, where one of their bartenders will guide your group through a demonstration and tasting of three cocktails. Take home recipe cards so you can shake and stir for years to come. Hint: Spirits and cocktail accessories also make for a meaningful, memory-making bridal gift. Is the bride a thrill-seeker? If so, how about gathering the girls for a skydiving lesson? Look to Skydive Twin Cities. Or you could start your day with stand-up paddle-boarding or kayaking through Minneapolis’ chain of lakes. Indoor rock climbing facility Vertical Endeavors, with four Twin Cities locations and one in Duluth, caters to group events, too. You could also consider participating in a glow-in-the-dark run or paint run, while wearing bachelorette-themed shirts. If you want to get out of town, head to Taylors Falls, just an hour northeast of the Twin Cities. After an easygoing hike through Interstate State Park, take in the views with a scenic boat tour. Then grab a refresher at Wild Mountain Winery (you earned it!) and stroll through the imaginative art of Franconia Sculpture Park. Outdoorsy, but also want to kick back and relax? 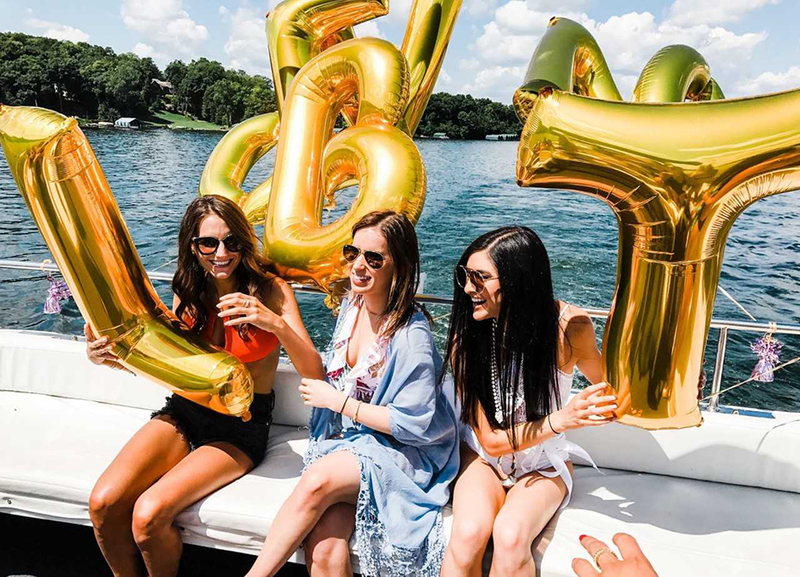 Rent a boat and cruise around one of Minnesota’s many lakes, with celebratory drinks, a festive lunch, a good playlist and plenty of sunscreen at the ready. Manicures, massages and facials? Yes, please! Pamper yourself alongside your lovely ladies at a metro-area spas. At the new SALT, in St. Louis Park, soak in the Himalayan salt room before indulging in spa services like facials or massages and noshing on healthy fare from their café. The Day Spa in Edina offers private spa parties, so you can mix and match from a selection of 27 services, including massages, pedicures and facials. A caterer and bartender will assist, and each guest takes home a gift bag. Bachelorette parties don’t have to end in hangovers. If you’d rather go to barre than the bar, you and the girls can work up a sweat at one of the Twin Cities’ myriad fitness studios. Whatever your workout of choice–cardio, yoga, dance–there’s a customizable class for you. Alchemy 365, a fitness studio that combines yoga, strength and cardio in high-intensity sessions, offers private and personalized classes in their four locations (Edina, Northeast and North Loop in Minneapolis, and Highland Park in St. Paul). They’ll work with you to develop a class that best suits your skill level and specific requests (perhaps a need to hear “Drunk in Love” during plank pose). Alchemy even offers their studio for an hour after class, so you can catch up (and cool down) with your gals. If yoga is more your speed, look to My Place Yoga, which offers on-site sessions. You pick the place; they’ll bring the instructor, yoga mats and water bottles, leading you through a class that fits your style. Namaste, indeed. Looking to break loose? Book a private lesson at Dollhouse Pole Dance Studio, where you and your ladies can shine under the stage lights. During a two-hour session with an instructor, you’ll learn tricks, spins and even choreography. Just grab your heels and get on stage. The complimentary Champagne can help quell any stage fright. For the city slickers, plan a weekend staycation in Minneapolis, near the action of downtown and the North Loop. Book a block of rooms at the Hewing Hotel, where you can stay in suites with uniquely Minnesotan charm. (Think playful Nordic design and custom Faribault Woolen Mills throws.) Don’t forget to add the rooftop package, so you can bask in the sun by the spa pool and traditional Finnish sauna as you take in the unparalleled view of the Minneapolis skyline. After gussying up with your gals, head to dinner at one of Minneapolis’s mainstays that routinely grace “top restaurant” lists; Spoon and Stable, Bar La Grassa, 112 Eatery and the Bachelor Farmer never disappoint. Then head downtown to catch a concert at the renowned First Avenue or performance at the Orpheum or State theater. Wrap up the night with a last-call cocktail at Tullibee in the Hewing, or Marvel Bar. Keep the good vibes going the next morning with a drag-show brunch on the Union rooftop, where queenly performers will serenade you between sips of mimosas. Cheers to that! What better way to feel good than a day of volunteering with your favorite gals? Aspects to keep in mind: choose a service project that is close to the bride’s heart, is interactive, can accommodate your wedding-party size and can be completed in about two to four hours. (And why stop there? You may even consider volunteering abroad.) Visit volunteermatch.org to find projects that suit your group. 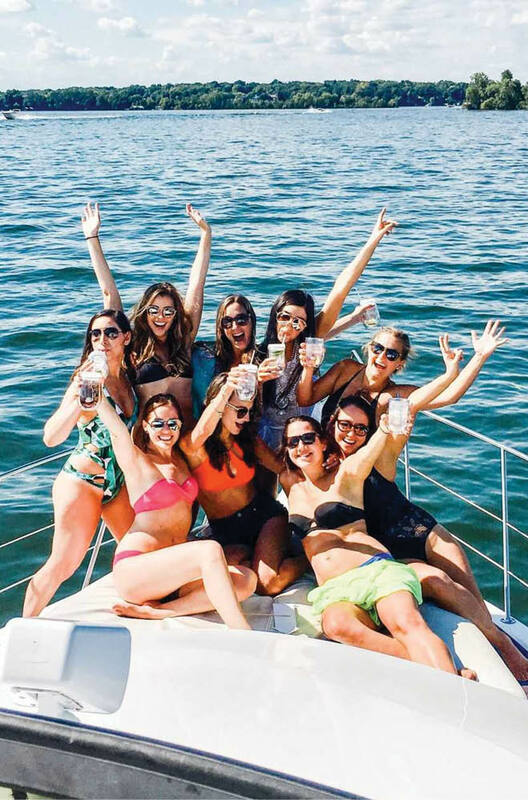 A few important factors to keep in mind as you’re planning the bachelorette bash of a lifetime. Talk finances first. Money is a tricky topic, so discuss it with partygoers well in advance. “Be sure to estimate costs ahead of time, including food, cover charges, drinks and cab fares, so that everyone can budget their money accordingly and negotiate until everyone is on the same page,” advises Folayan.